The Chandler AZ, senior sat on the shoulder of Victoria Vanriele (New Jersey) through the first 800m before pushing her way to the front of a tightly packed group that included, eventual runner-up Brynne Summer (Georgia) and Erica Vanderlende of Michigan. "I didn't really know who was going to take it out, but I was ready to go when I had to," said Foster of her pre-race thoughts. " I wasn't sure I was going to get in and running against a good field like this makes it special." Massachusetts favorite, Natick High Schools' Grace Connolly, urged by a raucous fan base moved quickly over the final 200m for an eventual fourth-place finish (4:51.78) while Lily Quinn (New York) got up for third in 4:51.63. 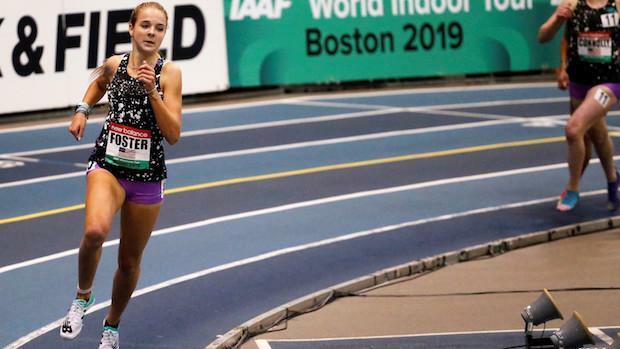 Newton South High School Junior Lucy Jenks took fifth, clocking an indoor season best of 4:51. "I tried to keep my position for the most part but I really couldn't kick because I lost a shoe", said Connolly. "But overall, I was happy with it. I felt we went out slow but it really picked up on the second 800." St. Anthony's (Huntington, NY) senior Matthew Payamps essentially bolted from the gun and rode the front to a solid victory in the Boy's Junior Mile; finishing in 4:12.39. Second place went to Sean Dolan of Hopewell Valley High School (Pennington, NJ). Also in the mix for the majority of the contest was junior Cruz Culpepper of Niwot HS in Colorado, who hit the line in 4:13.24. "I remained confident that I could move to the front and stay there," said Payamps. "The pace was to my liking right from the beginning." 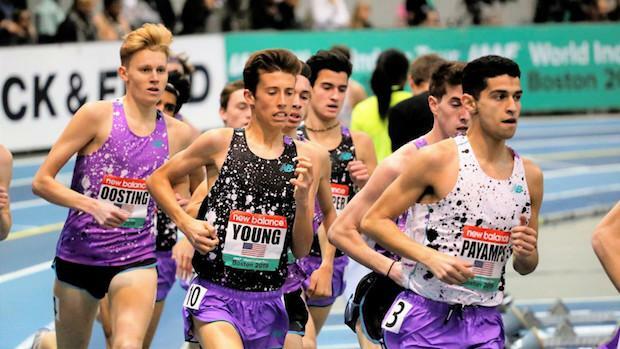 Arlington High School senior Ryan Oosting; a significant number of big meet experiences under his belt, moved on the field with a vivid last lap (28.30); ultimately placing fourth in 4:13.32. The heightened anticipation for the professional debuts of sprinters Sydney McLaughlin and NCAA 200m champion Gabby Thomas undoubtedly proved the major draw of the day and both emerged unscathed from the experience. McLaughlin took the 500m in 1:09.46 while Thomas, running an admittedly unfamiliar 300m test, garnered second behind Kendall Ellis (36.97) in 37.03.